cblasz wrote: Do you guys find that drinking water helps with weight loss? It has got many benefits and eases the hunger feelings. I had a kidney stone about 20 years ago and since then drink a minimum of two litres a day, more often three litres. In that period I've been pregnant, was 30kg heavier than I'm now, so it probably helps but is only one factor in overall weight loss. The colour of your urine is a good indicator whether you drink enough. @MaryAnn, we still have about 19 or so days to go so now that you're back on track, you can reverse some, most or all of what you gained! Yay! I have to walk 32 kilometres around Sydney Harbour tomorrow. 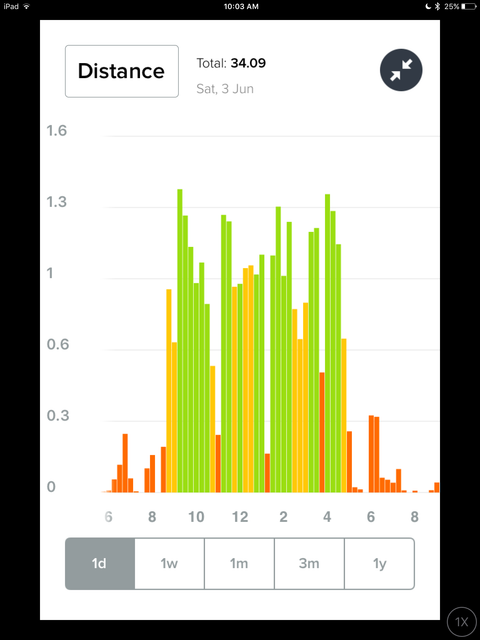 I am 10kg (22lbs)heavier than last time I did this walk in 2013 which is very tough. 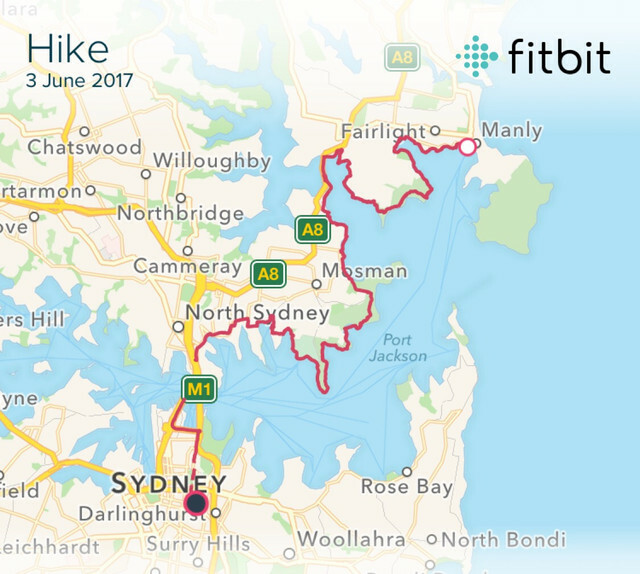 Manly to Darlinghurst. Should I fast?? Ha! Nooooo way! Good luck with the walk. It sounds great!! And definitely don't fast. This is one of those excuses to eat almost whatever you want! Hi, fellow fasters! I have tried to write a post a couple of times and it has disappeared before I have finished! I ended up fasting on Wednesday and Thursday this week. I have never done two back to back fasts before and didn't intend to this week but I was so busy on Thursday that it got to 5pm and I realised that I hadn't eaten anything so decided to keep away from food until dinner time! Hopefully, this will help to counteract my over-indulgence at the beginning of the week and help towards my Sunday weigh-in. I may even fast tomorrow, if I can summon up enough enthusiasm! @CandiceMarie, that is a phenomenal amount of weight to have lost! Have you posted any photos lately? I would love to see some before and afters! My weight loss hardly shows despite having lost twenty pounds since I started this four years ago. I am tall and carried most of it around my waist, hips and thighs - all areas usually hidden under carefully chosen clothes! I feel much better for it and just want to lose these last few pounds to get back down to my target weight! Three and a half measly pounds is surely not too much to ask! Mind you, I have only myself to blame - no-one made me eat so badly! Anyway, stay strong everyone. Not long now to the end of the challenge, so one final push for success! Onwards and downwards! That's a long walk, but I assume the views are wonderful! Is it a fundraiser? You are no doubt walking as I type - I look forward to hearing how it went. Hope no blisters! My challenge is not happening at the moment... Just can't get motivated. Cold grey weather doesn't help. I am not hugely overindulging, but probably eating a bit more than I need. It is back to being pretty quiet on the forum. Haven't heard from @Tracieknits for a while, or @Zesty, I don't think. Maybe those in countries where it is (almost) summer are outside enjoying good weather?? I am sitting with a late morning cuppa, then do need to motivate myself to do something productive!! Hi everyone, I'm struggling a bit too. Again, just the end of year craziness and too much food being around, etc. I'm hanging in there though. If I didn't at least try, it would be even worse. I've been eating my principal's candy again though and that's not good. I have to go back to a strict "no" policy on that!! It's not super nice here yet,@Sassy1 In fact, it's still been pretty rainy. But it should be getting better soon. Sometimes when people aren't doing well, they stop posting, which of course they don't need to do, because we all understand! Anyway, I'm meeting a friend for late lunch today, so trying not to eat until then. I don't have any social plans tonight, so I'll cook at home, which is always helpful. I hope to get exercise in both days! Have a great weekend! I'll be back to check in with my weight on Monday! Thanks @Cblasz and @Sassy1 for your well wishes for my walk yesterday. Originally, four years ago, it was a fund raiser for a nice guy with cancer. He has since passed so yesterday was organised by his family as a bit of a remembrance. There are hills, stairs, hills and more stairs the whole way. Nice view though. It stops being fun after about 20km. It rained on us as well. However, once it's over, it is such a feeling of accomplishment. Yay. Pity about the rain, @Fat_Teacher but a marvellous walk to do - for many reasons it seems. You must be very pleased with yourself for making the distance, wearying though it was. I have walked some small bits of that route. Whenever I visited Sydney (which I used to do quite often when I was working) I always aimed to walk across the Harbour Bridge, ideally at night, as the view back to the city lights is so spectacular. And the one and only 48 hour 100km Oxfam walk I did (13 years ago) was in Sydney, and it finished along the coastline to Manly, as yours did. I do remember the steps from that part of the walk! @Cblasz, it IS a pity that people don't post when they are finding it tough, ideally that should be the time to seek support. We have all been there. I will try to firm my resolve again... from tomorrow. I really think I do have to ban chocolate and the like from my daily diet, and limit it to special occasions. But can I do it? I will be glad when the solstice is here - not for the end of the challenge, but so that our daylight hours start getting longer. Hang in there, fellow challengers!! I walked with a veteran of the infamous Oxfam, yesterday, @Sassy1. She did the 100km in 36 hours. She had hallucinations, lost toenails, the whole bit! I doff my hat to you. Hi @fat_teacher I lost toenails too, feet were a mess! We took 43 hours... I was the slow one for most of the time but at the end I found something extra and was able to help the whole team to the finish. This was the first serious walking I had done - well, the preparation for it was. Wish I had had walking poles - now I use them all the time, and what a difference they make. Also really good hiking boots. But I don't know what could help with the sheer exhaustion! Well, I'm down 1/2 pound this week, but that's still 1 pound more than I was at my lowest (during this challenge) on May 8th. But I'm feeling very committed this week. I'm also going to weigh myself on Friday, so I can get an idea of how much damage I do on the weekend and try not to!! It's June Solstice Weigh-In Day. 101.8kg (224.4lbs). Ridiculous energy expenditure does pay off. I'm hoping everyone else has a good final three weeks of this challenge. Even if you don't even lose a pound and end up right where you started, 1. You made an effort (how many people can't even do that) and 2. You haven't gained any weight after two months (how many people can say that). Good to hear the pain had some other benefits, @fat_teacher!! !